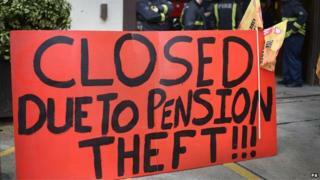 Firefighters in England and Wales have begun a new series of strikes in a long-running pensions row. Fire Brigades Union members walked out at noon on Saturday for two hours and again for an hour at 22:59 BST. Strikes will be held at the same times each day until 16 August. The government has accused the FBU of an "illogical" approach, but the union accused it of "walking away" from talks after the new fire minister cancelled a planned meeting. Union leaders said they had been due to meet Penny Mordaunt on Thursday, with FBU assistant general secretary Andy Dark saying she had "scuppered an opportunity to find a solution". Firefighters have already held walkouts over ministers' plans to raise their retirement age from 55 to 60 and increase their pension contributions, with the first taking place last September. The union says it fears many members could fail the fitness tests required to remain on active duty in their late 50s and have to leave the service as a result. The FBU also said proposals would mean that if firefighters opted for early retirement, the reduction in their pension would be "unacceptably high". Fire brigades will put contingency plans in place during the industrial action, including the use of contract staff, but fewer fire engines will be available. The government said the deal on offer was fair. A Department for Communities and Local Government (DCLG) spokesman said: "The government put forward a better package on pensions and we were expecting to hear the FBU's views with a further meeting scheduled for Thursday [7 August] following the executive meeting to make further progress. "Rather than do that the FBU have inexplicably escalated strike action, causing talks to fail. Let's be clear, the only reason further meetings are no longer scheduled are the FBU's actions." The spokesman added that the government will "continue to make progress" on issues of concern to firefighters, and that Ms Mordaunt is currently touring the country to hear their views.